CABLE HIGHLIGHTS: The horsemen of the Apocalypse continued to ride, as TLC’s DR PIMPLE POPPER kept its Wednesday cable throne, down 0.04 to 0.59. On VH1, BLACK INK CREW gained 0.04 to 0.50, and MARTHA & SNOOP’S POTLUCK DINNER was at 0.32/0.26, compared to last week’s 0.24/0.24. Bravo’s REAL HOUSEWIVES OF NYC dipped 0.04 to 0.46. Paramount’s YELLOWSTONE rose 0.04 to 0.42. MSNBC’s RACHEL MADDOW SHOW had an easy cable news win in the demo at 0.34/0.51/3.1M, with Fox News’s HANNITY at 0.26/0.48/3M, and CNN’s CUOMO PRIME TIME at 0.23/0.32/1.2M. On MTV, CATFISH edged up 0.02 to 0.31. 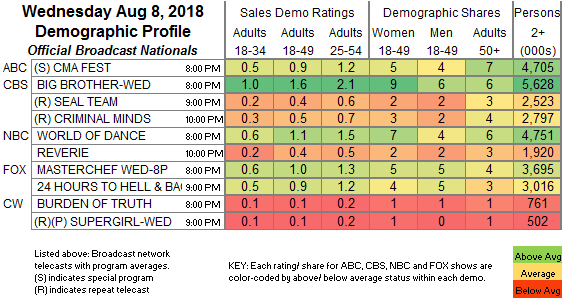 TBS’s FULL FRONTAL climbed 0.03 to 0.31. On HGTV, PROPERTY BROTHERS slipped 0.02 to 0.31, HOUSE HUNTERS was at 0.28, and HOUSE HUNTERS INTL was down 0.02 to 0.25. On ID, BROKEN TRUST grew by 0.04 to 0.30, and REASONABLE DOUBT was down a tick to 0.25. On USA, THE SINNER slid 0.02 from last week’s season premiere to 0.29, and SUITS was up 0.03 to 0.27. On Discovery, MISFIT GARAGE gained 0.03 to 0.28. Food Network’s GUY’S GROCERY GAMES ticked down to 0.25. 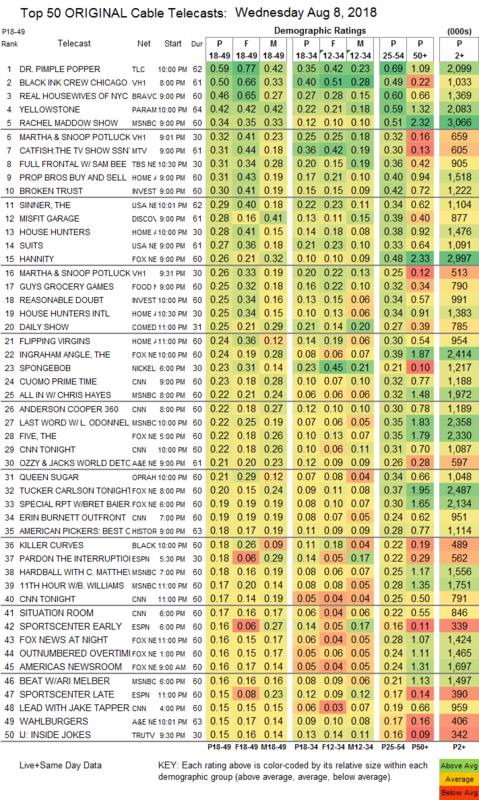 Comedy Central’s THE DAILY SHOW nosed into the Top 20 at 0.25. On A&E, OZZY & JACK’S WORLD DETOUR ticked down to 0.21, and WAHLBURGERS was down 0.02 to 0.15. OWN’s QUEEN SUGAR lost a tick to 0.21. BET’s KILLER CURVES was at 0.18. Freeform’s ALONE TOGETHER was at 0.04 and (off the chart) 0.03/97K, compared to last week’s 0.07/0.06. El Rey’s LUCHA UNDERGROUND was steady at 0.03/115K.